Your paths have crossed and destiny has found you. You are in love and preparations for your wedding day have begun. Congratulations on your engagement and best wishes of ever lasting joy, prosperity, and well-being in your marriage. Allow me to introduce myself, I am Rev. Christopher and it would be my honor to officiate your wedding. This is your special day and you deserve a ceremony that will encompass a unique style, charm, and warmth. Your wedding should reflect the very nature that defines you. Marriage is a truly wonderful and deep commitment. The ceremony is the outward display of your love for each other. Your ceremony is the center piece and primary focus of your wedding. It is significant and vital. Your selection of a wedding officiant should be also. 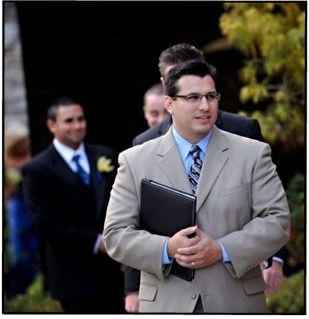 As your Orange County Wedding Officiant I will always be formal, caring, and take your vows seriously. My personality is friendly and positive. I am a non-denominational minister who has been involved in ministry leadership and teaching for over 15 years. I have over 17 years public speaking experience. I have completed a 2 year /4 semester (17 class) study program for my ordination. Also, I went through a church board review to demonstrate my qualifications, my university studies (bachelors degree - 1993), and an additional 1 year (9 courses) in new marriage and relationship counseling and I'm a certified relationship counselor. Now that I'm in my 40's, I have learned many things, but the greatest wisdom I have learned is that I happily accept that I don't know everything and that life is an ever evolving experience that we must become captivated with. As an ordained minister and wedding officiant I promise a ceremony that is caring and warm, a touch of class and style, and your ceremony will always be inspiring and heart felt for all. I take a great joy in officiating weddings and will take my position as your minister professionally. I promise to make your special day... memorable. Thank you for taking the time and considering me as your wedding officiant and again congratulations.